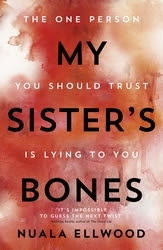 If you can't trust your sister, Can you trust anyone? Kate has spent her life running from her past, she left home and went to university, became a journalist and never looked back. Then one day her mother dies and all of a sudden she has no choice but to return to Herne Bay, the place she grew up, the place her sister never left. With Kate living a successful life, a budding journalist, travelling the world, running into war zones to get the hottest stories and finding a voice for those who can't speak up themselves. Sally on the other hand never left Herne Bay, drinks too much, won't admit she drinks too much, her marriage is in shatters and her daughter is long gone. Two sisters living two very different lives. But is all as it seems? Is Kate seeing things and hearing voices? What is going on in the house next door to Kate and Sally's mum's house? And is everyone who they make out to be? I got this book as an advanced copy from NetGalley in exchange for an honest review. This book has more twists and turns than a rollercoaster at Alton towers and I loved it. Just when you think you have it all worked out you realise you don't. I could not put this book down I read it in a single sitting overnight it was that good. Would defiantly recommend to anyone looking for their next great psychological thriller. The plot is well-written and easy to follow. The characters have you screaming inside wanting them to realise what is happening at times and at other times it has you wishing you could read faster to find out whats happening. A really great read, four out of five stars very well deserved, leaves you wanting more. Can't wait for more from this author.